My friends and family often say that I am obsessed with, or addicted to Disney because I am always looking into or planning our next Disney vacation. We first took our children to Walt Disney World in 2008, when my son was 6 and my daughter was 2. 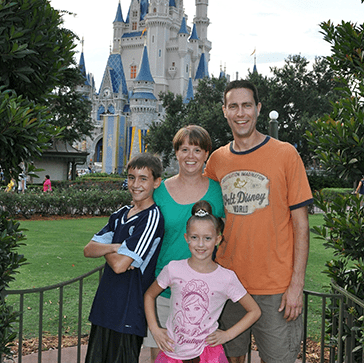 We returned again in 2012 and have returned to Disney World every year since because my children cannot imagine a year without Disney. We are frequent travelers and have gone to places like Montana, Mexico, South Dakota, Chicago, Kansas City, New York City, Detroit, Saint Louis, and Memphis as a family. My kids will both tell you that their favorite place to travel is Disney World. I love that Disney World is a place that is relatively stress free once we arrive. All of our dining and transportation is taken care of once we get off the plane. I appreciate that we are treated very well, and stay in world class accommodations while we spend quality time as a family. Like I mentioned earlier, I begin planning our next Disney vacation as soon as we finish the vacation that we are on. I frequent Disney sites like the Disney Mom’s Panel, the Disney Food Blog, the runDisney Blog and site, the Disney Parks Blog, and many Disney Facebook pages. I also have some experience with both Universal Florida theme parks and SeaWorld. I would love to share my knowledge and passion with others. I think that having someone with knowledge of the parks and systems like FastPass + and Advanced Dining Reservations is crucial now that these offerings are a must for a stress free trip.